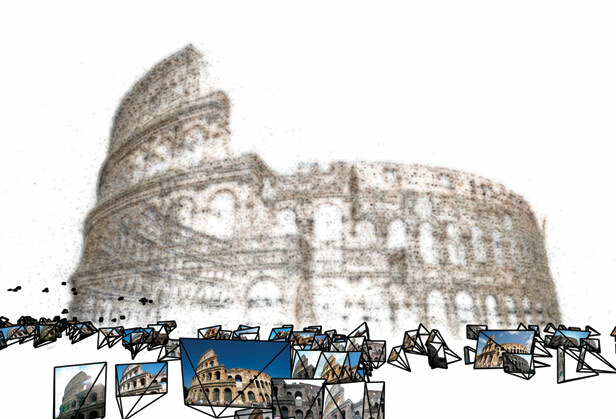 Building Rome in a day: This digital model of the Colosseum was assembled by stitching together tourist photographs. See 2011 TR35 winner Noah Snavely present his work. Every snap of a shutter—be it the subtle click of a DSLR or the artificial ka-chak of a smart phone-—turns three-dimensional reality into a two-dimensional image. Noah ­Snavely is taking those images and using them to create 3-D digital models of structures ranging from individual houses to entire cities. In 2006, as part of his PhD studies at the University of Washington, Snavely created a system that could assemble such models using an unstructured assortment of images from different cameras and viewpoints. "If we can find matching points between views," he says, "we can reason about where each image was taken and what the 3-D shape of the scene is." In 2008 his work was commercialized as Microsoft's Photosynth service, which allows users to upload photo collections and view them in a 3-D reconstruction of the space where they were taken. Snavely has even used his technology to reconstruct the city of Rome from the wealth of amateur images available online.